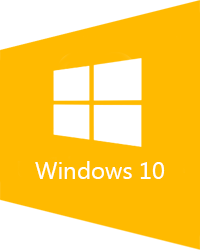 Microsoft have announced the release date for its new operating system, Windows 10, which will be the 29th July 2015. For the first time ever Microsoft are allowing users of previous operating systems (Windows 7/Windows 8.1) to upgrade to Windows 10 for free providing they do so within the first 12 months of Windows 10 being released. So how do I get my free version of Windows 10? 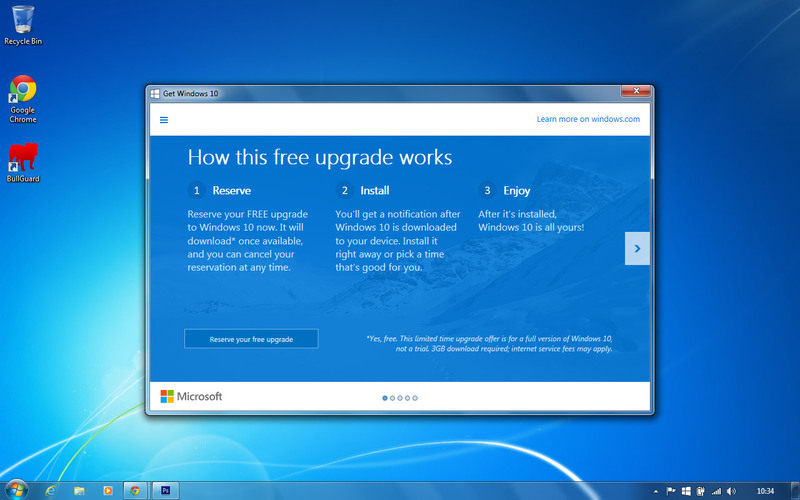 If you have a system running a qualifying older version of Windows that meets the minimum hardware requirements to run Windows 10 then the Windows 10 Upgrade App should download onto your system via Windows Update. You will need to ensure that you have got Windows Updates turned on. Once the Windows 10 Update App has downloaded to your system, you should notice a new icon in your system tray (usually towards the bottom right of your screen) – see image below (click image for a larger version). Once you click on the Windows 10 Upgrade App icon it should bring up a new window – Get Windows 10. In this new window will be information telling you how the upgrade process will work and a button to reserve your free upgrade – see image below (click image for a larger version). 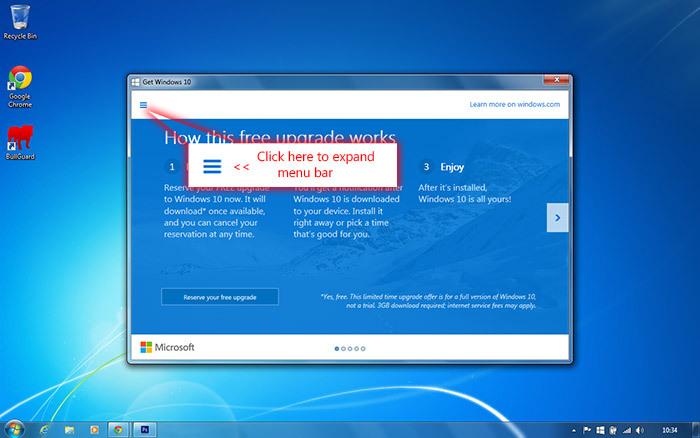 If you click on this button it will give you an option to enter your email address to reserve your free upgrade to Windows 10, as well as to receive updates and news as Windows 10 nears its release date – see image below (click image for a larger version). That’s it! 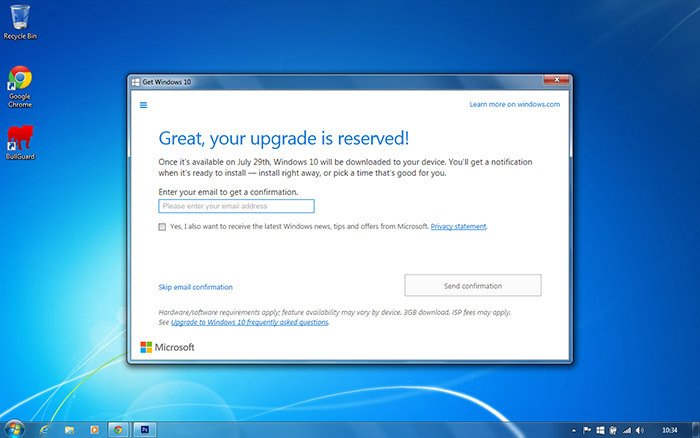 your copy of Windows 10 is now reserved and once released it will automatically download onto your system and notify you once it is ready to be installed. As with any new operating system (OS) PC Care would always advice caution before jumping straight in and updating as soon as it is released. Inevitably when new OS’s are released they are buggy and can be quite unstable or temperamental. It can take a few months of updates, hot fixes and patches being created and released before a new OS becomes reliable enough for everyday use. So long as you complete the upgrade to Windows 10 with 12 months of it being released (ie before July 2016) you will be fine. How do I know if my system can run Windows 10? If you want to check that your system is capable of running Windows 10 you can check your PC via the Windows 10 Upgrade App. All you need to do is click on the Windows 10 Upgrade App icon (click here for an image if you are unsure what this is). 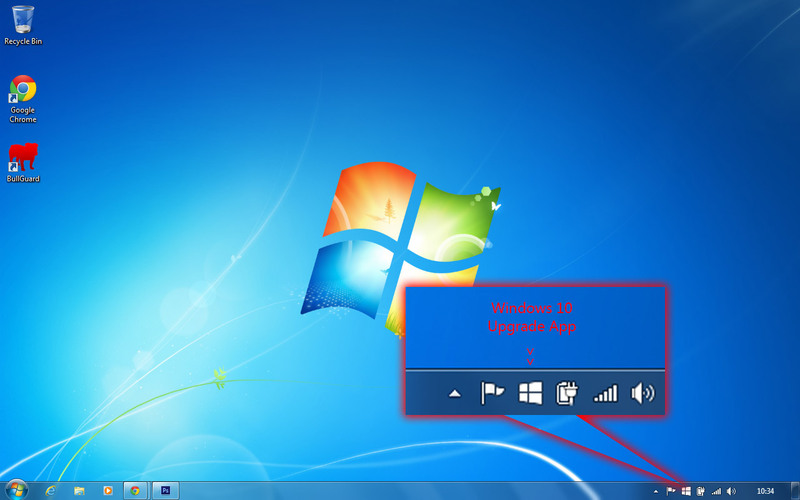 Towards the top left of the Get Windows 10 screen you will see three small horizontal lines, click on them to expand a menu – see image below (click image for a larger version). Once you have the menu open on the left of the screen, you should see an option to “Check your PC”. Click on this menu item and you should get a compatibility report for your system – see image below (click image for a larger version). Hopefully no issues will be detected with your system and you are safe in the knowledge that if/when you do choose to install Windows 10, that everything inside your system should work fine with the new operating system. 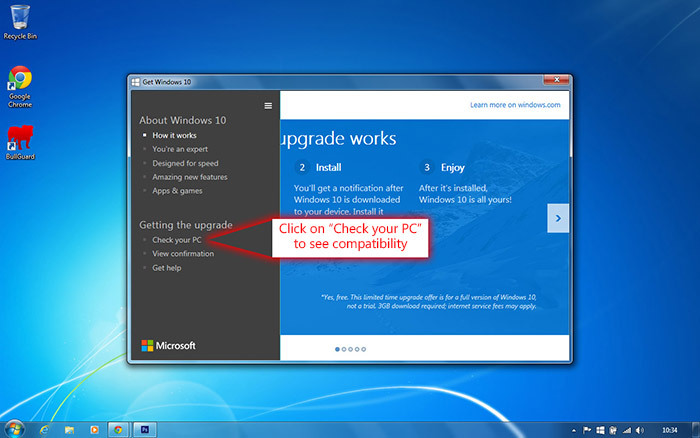 If however the compatibility checker does highlight any issues (such as in the image below) it does not necessarily mean that you can’t install Windows 10. Many issues can be resolved by updating drivers , downloading the latest versions of apps/programs or upgrading the component that isn’t compatible. 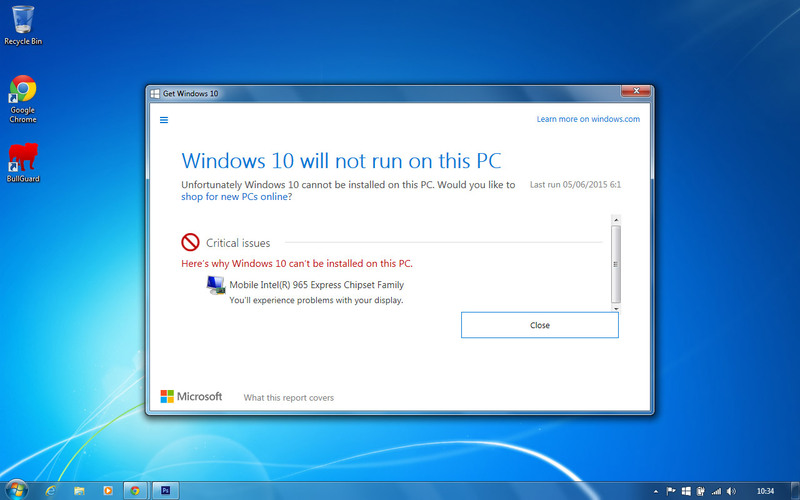 If you are unsure about any points highlighted by the Windows 10 compatibility check the please feel free to contact PC Care and we would be happy to offer any advice on solutions to compatibility issues. Below: an example compatibility report highlighting a potential issue with a graphics chip inside a laptop – click image for a larger version. But what happened to Windows 9? The truth is that Microsoft have not really answered this question. There are however several theories/rumors circulating around the decision by Microsoft to skip Windows 9 and release Windows 10. The first theory is that Microsoft wanted to put a perceived distance between the disastrous Windows 8 operating system, so by jumping straight to Windows 10 will make users think that it is a completely new system with no links or throwbacks to Windows 8. This perception of Windows 10 being completely new is however false as Windows 10 is still based on the Vista Kernal, just like Windows 7, Windows 8 and Windows 8.1 before it. In truth Windows 10 is actually version 6.4 of the Windows OS. This was possibly a similar tactic used when Microsoft reverted from naming operating systems (XP, Vista, etc) back to numbering them with Windows 7. Although Windows 7 is built on the Vista Kernal and is technically version 6.1, by naming it Windows 7 it created a perceived distance from the terrible Windows Vista. The second rumor is based around the way certain programs and apps are designed, built and coded. Some programs are still designed to check for Windows 95/98 and potentially have code in them that looks for Windows 9 (ie checking for Windows 9x), so to avoid any compatibility issues Microsoft chose to skip naming their new OS Windows 9 and went to 10. The third theory around this mystery is that the number 9 is considered to be an unlucky number is some cultures, particularly in Japan. As the Japanese market is quite large for Microsoft they may have decided to skip the number 9 to avoid any superstition or ill feeling towards the OS in Japan. This has been done before with companies like Trend Micro who skipped version 9 of their Internet Security software.